Captain David McCampbell, USN, (Ret), graduated with the Class of 1933 from the USNA, and was designated Naval Aviator Number 5612, in 1938. Campbell is the Navy's all time leading ACE with 34 confirmed kills during one tour in WWII and with 9 kills in one sortie. Both were records for American Aviators. Campbell served in Ranger and Wasp in the early part of WW II. 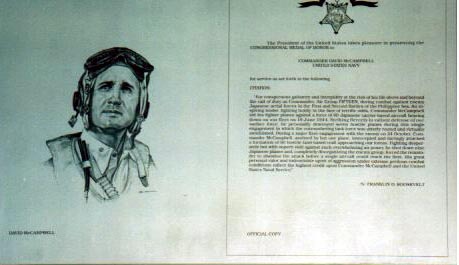 Assigned as CO of Fighting Squadron 15 in AUG, 1943, he assumed command of Air Group 15, Essex in FEB, 1944. His CAG 15 Air Group, Essex sank more shipping and downed more planes than any air group in Naval Aviation history. He is the recipient of the Medal of Honor, Navy Cross, Legion of Merit, Silver Star and Distinguished Flying Cross. 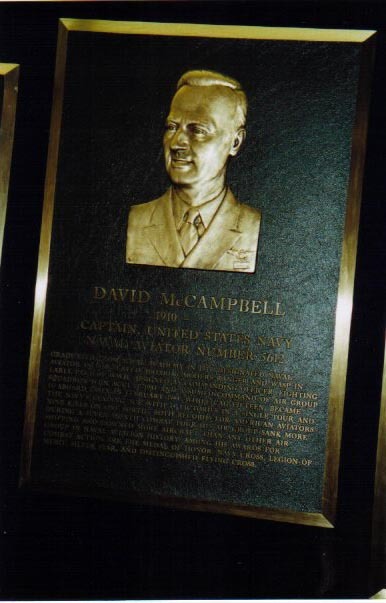 David McCampbell was a long time resident of Palm Beach County, where most of our current ANA Squadron resides. As a recent tribute, the Navy named one of the newest class Arlie Burke Destroyers, USS McCampbell, DDG 85. The Terminal Building here at Palm Beach International Airport was named McCampbell Terminal in his honor, with a very nice area set aside for the display of some of his memorabilia. In view of his well recognized record of achievements and honors, it seems most appropriate for our Squadron to bear his name, which is one of exceptional distinction in the annals of Aviation. All Naval Aviators look up to and admire his well documented heroic exploits. Of some interest, McCampbell's neice, Patricia O'Rourke, was married to the 1940's actor Wayne Morris. Morris served under McCampbell who was his Squadron CO and later his CAG. Wayne, also was an ace scoring 7 confirmed kills during the war. Morris literally died in McCampbell's presence in 1959 on board The Bonne Homme Richard during a carrier visit to the ship under his uncle-in-law's command. McCampbell, a long time resident of W. Palm Beach, FL, died there n 1996 at age 86. McCampbell's Aces Squadron, Inc. (MCAS), a member squadron of the Association of Naval Aviation, is organized EXCLUSIVELY to advance education and public awareness by assisting in the exchange of information between its members and the civilian community in regard to the history and activities of Naval Aviation and its importance to National Security within the meaning of Section 501 (C) 3 of the Internal Revenue Code. Furthermore, it shall periodically contribute those funds in excess of its reasonable operating needs to worthwhile charities and other causes with a Naval Aviation affiliation. The squadron shall not engage in any activity which is not in furtherence of its mission and in complete compliance with the requirements of Section 501(C)(3) of the Internal Revenue Code of 1954, as amended, and regulations issued thereunder, and shall operate as a not-for-profit organization.